Our Ylang-ylang Essential Oil Extra comes from flowers of Cananga odorata trees grown here in the Philippines. Native to the country, they are usually strung with sampaguita to form garlands of flowers to be sold at churches. Ylang-ylang’s popularly accepted translation is “flower of flowers.” Regarded as a mood setter in some countries of Asia, the flowers of Ylang-ylang are traditionally laid out in matrimonial beds. The perfume industry utilizes much of the oils produced from Ylang-ylang because of its sweet, floral-fruity and fragrant smell. 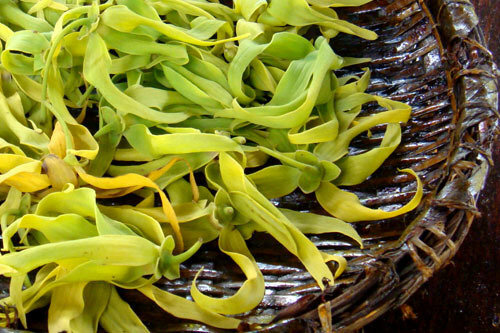 Here in the Philippines, several provinces have been actively producing Ylang-ylang essential oil. Our essential oil is called "extra" because it comes from the first few hours of distillation and contains the most volatile components of Ylang-ylang. Other grades are Ylang-ylang II, Ylang-ylang III and Ylang-ylang complete.